Veterinarian-Approved Because It Really Works! NEED HELP? Email us at support@askariel.com We are glad to help and will respond promptly. 2) Probiotic--fights infection and yeast--imperative if your pet has been on antibiotics. If you don't use this, no matter how acid the urine, the infection will most likely return. 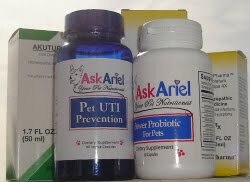 In your pet's best interest, we require Probiotic to ensure success in tackling your pets chronic UTIs. 3) Renelix--flushes out the toxins from the kidneys and urinary tract. Helps restore normal kidney and urinary tract function. Helps with inflammation, bladder and kidney stones, crystals and mineral deposits. Use this product if your pet has ever had kidney or bladder stone or crystals or kidney disease or incontinence. 5) Notatum-infection fighter--this product is excellent for long-term use to keep infections under control, boosts immune function, helps get rid of infections even when the pet is not responding well to antibioticsDiet is a big culprit with chronic UTIs.